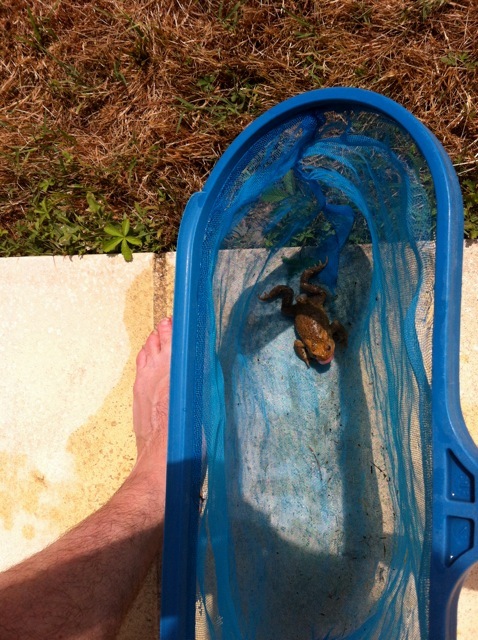 Currently I am on holiday in France, deeply phased by finding a frog in our pool. That wasn’t a derogatory poke at our French neighbours. Had it been, even now the family might be making statements to the gendarmes as to exactly where we were on the night of the 27th and did we have alibis? As the only statements my daughters will make on holiday are of the fashion variety and the boys are monosylabs, this might have proved tricky. The pool pump hadn’t been working properly, so the water had turned a deepish shade of frog-green, cloudy enough that we couldn’t see our feet, easily concealing a largish amphibian (about fore-foot size, but not four foot, except as my son described him as the one that got away) in the murky depths of the deep end. My youngest son found it by the simple expedient of picking it up when foraging for something else. He returned to the surface a pale shade of frog. The eldest swam down to look and, relying on his A-level Biology, worked out that as it was lying on its back, legs outstretched, not moving, it was either a fabulous actor or dead. As it was a French frog we named it Gerry the ex-Grenouille. Gerry had settled back to the depths, our swimming currents swishing him to a place unknown, and so the Great Amphibian Hunt began. We tried using two frogscopes, plastic jugs shoved into the water, but the murk was too murky. Swimming along the bottom in goggles was equally unproductive, in my case because I was terrified I’d actually find him. Our combined efforts as frogmen (grenouille-hommes) were frankly useless. Even the pool net, normally so efficient at clearing insects, leaves and stray children, proved an inefficient frog-scoop. I should have been revolted, declining vociferously to get in the pool, but frankly it’s too hot to be terrified out of cool water. Maybe I’d feel different at an Oktober frogfest. Eventually finding it, we swiftly counted its legs to check that it hadn’t been someone’s lunch leftovers. Deciding that an aquatic burial was not appropriate, we went for a burial-at-field, discovering that the pool scoop worked as a very effective onager as we consigned Gerry to the field next door. The last we saw of him was flying through the afternoon sun, four legs outstretched in a glorious arc. Not certain that the pool is a frog-free zone, I’ve taken to not putting my feet down unless I can see the bottom, to be sure it’s devoid of squishiness. The pool is clearing, so I am beginning to wonder if we will find all manner of debris such as rusty bicycles, Coke cans or even a dead sun lounger lying on its back, legs in the air. Perhaps even Le Loch Ness monster; presumably he goes somewhere on holiday. We’ve been listening to Agatha Christie CDs in the car, so the amateur detective in me began to enquire into the unexplained death of the frog. Can’t have been dead long, there being no sign of rigor mortis, being found squishy. Not a mark on the body, so perhaps suicide; by jumping in and holding his breath, perhaps. But why? Maybe to enjoy the power to have us swimming around, revolted and terrified, yet compelled by a strange fascination to try and find his remains? In that case I’m no longer the master detective, I’ve been made into an amphibian’s plaything; frog’s pawn.